For the last eight years or so, The Skipper restaurant has been moored at Ventry, overlooking the nearby Atlantic Ocean. And fish from that ocean, delightfully cooked, has drawn customers here from near and far. But, aside from one or two farewell parties, dinner on September 30th may well prove to be the final fling for The Skipper, at least in this location. If a move is a must, and it looks like it, then owner-chef Paddy Chauvet, better known as Paddy The Irishman, may well turn up somewhere else on the peninsula, though Dingle town itself doesn't seem to be in the running. But there were no tears, out-front at least, last Saturday night week, lots of humour among the front-of-house if anything. And the blackboard was, as always, in use. The pier is only 100 metres away and so the menu is subject to frequent change. If you're a meat-eater, you'll be catered for - Boeuf Bourguignon was on the menu. And there was even a Vegetarian Dish of the Day. The wine-list seemed a bit run-down, there were red marks indicating “all gone” but there was still enough on the exclusively French list to satisfy most tastes. 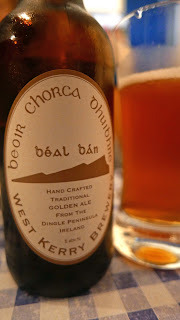 As it happened, I left the wine and picked a local beer, the delicious Beal Bán from the West Kerry Brewery which is less than three miles away. The use of fruit pieces in the salads was a bit unexpected, CL first to be surprised when she started her Smoked Salmon Salad. 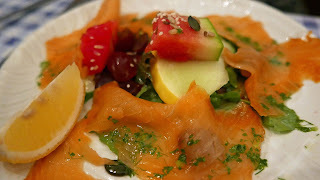 It was excellent, the fish perfect, the leaves fresh as can be and nicely dressed and the melon and grapes provided an extra dimension. The wind was blowing hard outside and my Seafood Bisque starter was nicely warm and full of flavour, and wouldn’t have been out of place on a seafront café in Marseilles. 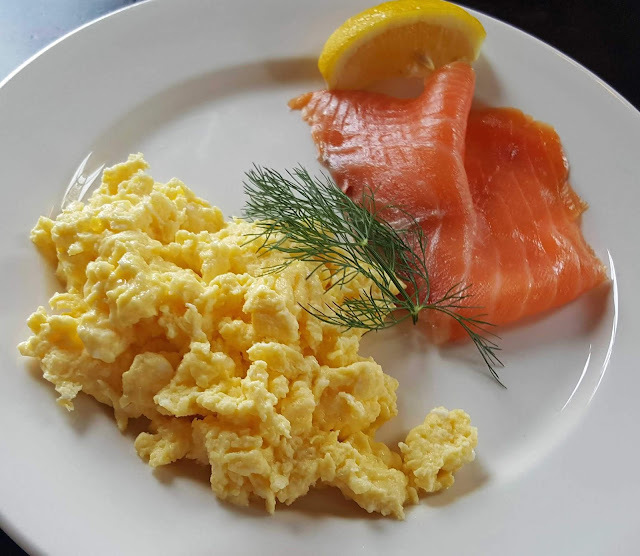 Service was excellent here, casual but efficient, and always a chat or a joke and soon the mains were arriving. I picked the Ray Wing, not usually found on Irish menus. 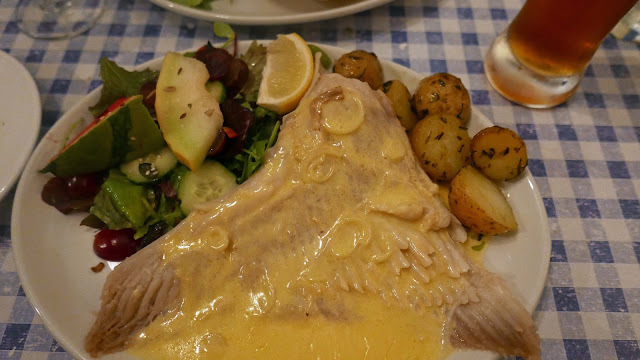 It came with a caper cream sauce and rustic potatoes, leaves and fruit pieces of course. Quite enjoyable and, like most dishes here, well priced too. CL's pick was the Seafood Gratin, a rather pedestrian name for what turned out to be a lovely dish. 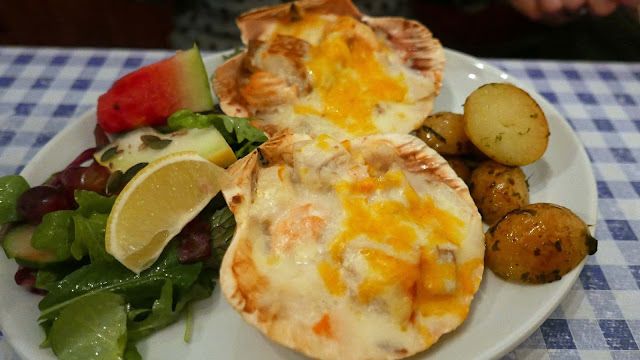 The gratin was presented in two large scallop shells with rustic potatoes, leaves and fruit pieces. All the leaves by the way were as fresh as could be and well dressed. And there was fruit too in the dessert but different! We were unlucky that the French Apple Tart was off so shared the Raspberry and Strawberry Fool. We wouldn’t go back especially for that but would certainly follow The Skipper around the peninsula for his superb savoury stuff. And more so, if they leave those back-breaking church seats behind! Bon Voyage, Skipper!